BEIJING – An explosion ripped through a state-owned colliery in northeast China, killing 134 miners and trapping 15 underground, just days after Chinese leaders called for vigilance to prevent major accidents. The blast late on Sunday was the latest disaster to strike Heilongjiang, whose capital city, Harbin, was held hostage for five days by a toxic spill coursing through the Songhua river that provides its water supply, forcing a shut-down of tap water. Li Yizhong, head of the country&#039s top work safety watchdog, urged about 270 rescue workers to spare no effort to save miners trapped at Dongfeng coal mine. Late on Monday, the official Xinhua news agency said 134 of the 221 men working underground at the time of the blast had now been confirmed killed and 15 were still missing. Investigators blamed the blast on coal-dust explosion , which knocked out all ventilation systems in the pit. The main system resumed operation on Monday. The accident came about two weeks after an explosion at a chemical plant in nearby Jilin province poured 100 tonnes of cancer-causing benzene compounds into the Songhua river. An 80-km (50-mile) slick passed down the Songhua River and out of Harbin at the weekend. Making no mention of the toxic spill, President Hu Jintao and Premier Wen Jiabao called last week for vigilance to prevent major accidents which cause huge casualties and property losses. They urged law enforcement agencies to implement stricter inspection measures and punish those responsible in accordance with the law, state media said without elaborating. Taps were turned back on in Harbin, home to 9 million people, on Sunday and Heilongjiang provincial governor Zhang Zuoji drank tap water to prove it was safe. But officials have warned residents to be on the lookout for symptoms of benzene poisoning, which can cause anaemia, other blood disorders and kidney and liver damage. Governor Zhang defended a government decision to delay announcement of the toxic spill by 10 hours, saying it was a “white lie”, the Legal Evening News reported. “We rectified this &#039white lie&#039…to protect the right of the people to know,” he was quoted as saying. The Harbin crisis has raised wider questions about the costs of China&#039s breakneck economic boom. Around 70 percent of its rivers are contaminated and the cabinet recently described the country&#039s environmental situation as grim. Water was discharged from nearby reservoirs to dilute the toxic spill and 1,000 soldiers installed charcoal filters at water plants to ensure water would be drinkable. Environmentalists have complained that China is not sharing enough information about the spill to protect Russia&#039s residents and rivers downstream from the Songhua. Chinese Foreign Minister Li Zhaoxing has expressed regret to Russia&#039s ambassador over the incident. 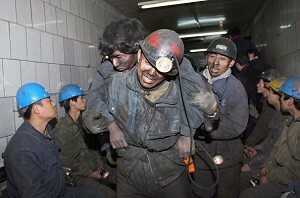 China&#039s mining industry is the biggest and the deadliest in the world. Accidents killed more than 2,700 miners in the first half of this year alone. On Monday, all 18 miners trapped by flooding at a separate accident at the Gaocun mine in the northern province of Hebei were confirmed dead, Xinhua news agency reported. Three mine managers disappeared soon after the flood, leaving rescue teams without a guide to search the underground warren. The country has launched safety campaigns to clean up and shut down illegal mines in the hope that consolidating China&#039s thousands of tiny and primitive operations will improve safety. Heilongjiang province said on Monday it would complete its consolidation by the new year, Xinhua reported. But booming energy demand and high coal prices have driven some mine owners to ignore regulations and Sunday&#039s blast, at a state-owned mine, shows that larger mines are not immune from disasters. Dongfeng coal mine is run by a branch of the Heilongjiang Longmei Mining (Group) Co. Ltd. — a conglomerate of four state-owned major coal businesses in the province, with a registered capital of 13 billion yuan ($1.61 billion). China&#039s worst coal mine accident this year killed 214 people at a state-run mine in the northeastern province of Liaoning. Accidents and disasters cause more than 1 million casualties annually in China. They also bring economic losses of 650 billion yuan ($80.5 billion) each year, equivalent to 6 percent of gross domestic product, according to Wang Jikun, a senior official with the Ministry of Public Security.